Gillard wins global praise for ‘misogyny’ speech Ninemsn Julia Gillard’s blast against “misogynistic” Tony Abbott in parliament yesterday has made international headlines, with one writer comparing the prime minister to the Incredible Hulk. Prime Minister Julia Gillard blasts Tony Abbott in extraordinary scenes in … The Australian PETER Slipper has unreservedly apologised for his comments on female genitalia following a fiery question time that saw the PM label Tony Abbott a misogynist. An unprecedented constitutional bid to sack the problem Speaker failed in Parliament today ..
Gillard accused of letting down Australian women The Sunday Times Prime Minister Julia Gillard was Wednesday accused of letting down Australian women by defending her tainted parliamentary speaker and using gender to deflect criticism. 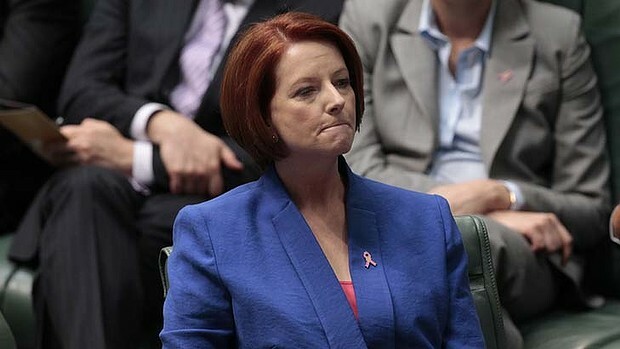 Gillard, the nation’s first woman leader, lashed out Tuesday at opposition leader Tony Abbott after he called for the removal of speaker Peter Slipper over lurid text messages which included crude references to female genitalia. Abbott sidesteps attempt to revive abortion pill debate Sydney Morning Herald THE Coalition has pledged not to change rules allowing the import of the abortion pill RU486, as Labor seeks to draw the Opposition Leader, Tony Abbott, into a debate about abortion. Not-so-secret women’s business becomes a man’s undoing The Canberra Times PARLIAMENT, traditionally a rather blokey forum, is having a feminine moment. Women have had the federal vote in this country since 1902. But it’s as though politicians have only just now discovered that half the population possesses what the now-former Speaker Peter Slipper would refer to in a text message as something un-printably Anglo-Saxon.